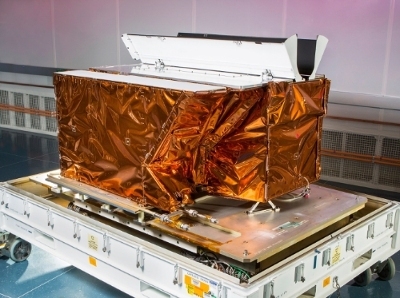 March 2, 2015 – Raytheon Company delivered a second Visible Infrared Imaging Radiometer Suite (VIIRS) instrument to support the National Oceanic and Atmospheric Administration’s (NOAA) Joint Polar Satellite System mission. The second VIIRS unit will fly aboard the JPSS-1 spacecraft, ensuring continuity of critical weather information currently being provided by its predecessor, the joint NOAA/NASA Suomi National Polar-orbiting Partnership satellite launched in 2011. Comprehensive testing at Raytheon’s Space Systems facility in El Segundo, California preceded its on-schedule delivery to Ball Aerospace and Technologies Corp. in Boulder, Colorado, for spacecraft integration. Testing confirmed that the VIIRS sensor will withstand launch conditions and operate as expected. Integration will begin immediately to support the scheduled launch of JPSS-1 in early 2017. VIIRS is widely known for producing unprecedented, detailed images of Earth including NASA’s 2012 Blue Marble visual image and for breaking new ground in the observation of evolving storm patterns at night. It also improves forecasters’ ability to predict severe weather with greater precision and is important for forecasting in Arctic areas, which do not receive geostationary coverage. VIIRS data is used for a wide range of applications such as monitoring harmful algal blooms, sea surface temperature and vegetation stress as a predictor of drought. JPSS is a collaboration between NOAA and NASA. NOAA is responsible for managing and operating the JPSS program, while NASA is responsible for developing, building and launching the JPSS instruments and spacecraft, and for developing the ground system.